China has certainly moved to the very top of the agenda in the financial markets this week and a lot of what is playing out in the Chinese markets is eerily similar to what happened in the US and European markets in 2008. As in 2008 there is a lot of focus on a bubble being deflated both among commentators and among central bankers. This in my view could lead to very unfortunate policy conclusions. I am particularly afraid that the People Bank of China’s fear of reflating the bubble will lead it to take too long to ease monetary policy – as clearly was the case in the US and Europe in 2008. China – an “ideal” Hayekian boom-bust? Market Monetarists are in general very sceptical about the Austrian story of the Great Recession and sceptical about a bubble explanation for the crisis. That, however, do not mean that Market Monetarists outright denies that there can be bubbles. In fact I certainly think that there was many examples of “bubbles” in 2008. However, the real reason for the bust was not overly easy monetary policy, but rather that monetary policy became insanely tight both in the US and the euro zone in 2008. But how do that compare to the Chinese situation today? I have earlier argued that I don’t believe that easy monetary policy on its own it enough to create a major bubble. We need something more – and that is the existence of moral hazard or rather the implicit or explicit socialization of the cost of risk taking. One can certainty argue that Too-Big-To-Fail has been and still is a major problem in the Western world, but that is even more the case in China, where the banking sector remains under tight government control and where the banks are mostly government owned. Furthermore, the investment decisions in many industries remain under strict government control. In that sense one can argue that China over the past 4-5 years have had the “ideal” environment – easing money and massive moral hazard problems – for creating a bubble. The result has most likely also been the creation of a bubble. I have no clue have big this bubble is, but I feel pretty certain that the Chinese government run banking system has created serious misallocation of capital and labour in the last 4-5 years. In that sense we have probably been through a Hayekian boom-bust in the Chinese economy. The Chinese authorities have been extremely focused on how to deflate what they consider to be a bubble and as a result Chinese monetary and credit policies have been tightened significantly since early 2010 when the PBoC the first time in the post-crisis recovery tightened reserve requirements. Hence, since 2010 the PBoC has basically tried to “deflate the bubble” by tightening monetary conditions and as a result the Chinese economy has slowed dramatically. The PBoC obviously has been right to tighten monetary policy, but I have for some time though that the PBoC was overdoing it (see for example my post on “dangerous bubble fears” from last year) and in that regard it is important to remind ourselves of Hayek’s advice on conduct of monetary policy in the “bust” phase of the business cycle. When Hayek formulated his version of the Austrian business cycle theory in Prices and Production from 1931 he stressed that the monetary authority should let the bubble deflate with out any intervention. However, he later came to regret that he in the 1930s had not been more clear about the risk of what he called the “secondary deflation”. The secondary deflation is a “shock” that can follow the necessary correction of the “bubble” and send the economy into depression. If we formulate this in Market Monetarist lingo we can say that the central bank should allow nominal GDP to fall back to the targeted level if there has been a “bubble” (NGDP has accelerated above the targeted level). This will ensure an orderly correction in the economy, but if the central bank allows NGDP to drop significantly below the “targeted” level then that will could trigger financial distress and banking crisis. This unfortunately seem to be exactly what we have seen some signs of in the Chinese markets lately. The graph below shows two alternative hypothetical scenarios. 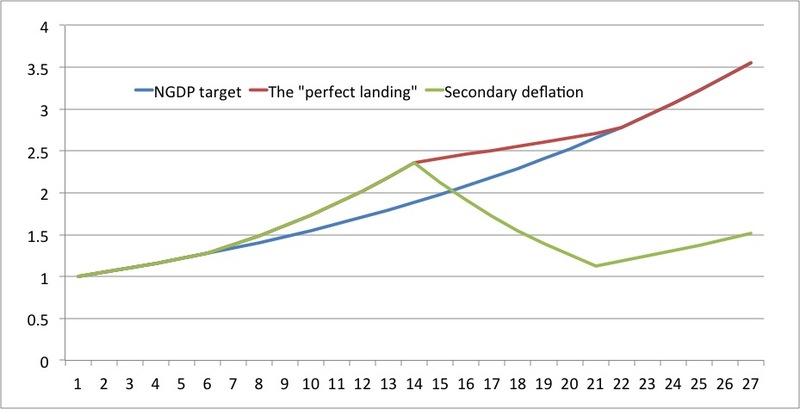 The red line is what I call the “perfect landing” where the NGDP level is brought back on trend gradually and orderly, while the green line is the disorderly collapse in NGDP – the secondary deflation. The PBoC obviously should avoid the later scenario. This is what the ECB and fed failed to do in 2008. I must admit that my fears of monetary policy failure in China have increased a lot this week, but luckily a secondary deflation can still be avoided if the PBoC moves swiftly to ease monetary conditions. However, I see a number of reasons why the PBoC might fail to do this. First, there is no doubt that the PBoC is preoccupied with the risk of reflating the bubble rather than with avoiding secondary deflation. This I believe is the key reason why the PBoC has allowed things to get out of hand of the past weeks. Second, significant monetary easing will necessitate that the PBoC should allow the renminbi to weaken. There might, however, be a number of reasons why the PBoC will be very reluctant to allow that. The primary reason would probably be that the Chinese do not want to be accused of engineering a “competitive deflation”. In that regard it should be noted that it would be catastrophic if the international community – particularly the Americans – opposed renminbi devaluation in a situation where the crisis escalates. Third, the PBoC might feel uncomfortable with using certain instruments at its disposal for monetary easing. One thing is cut banks’ reserve requirements another thing is to conduct to do outright quantitative easing. We know from other central bank how there is a strong “mental” resentment to do QE. I strongly hope that the PBoC will avoid remarking the ECB and fed’s mistakes of 2008, but the events of the past week certainly makes me nervous. Monetary policy failure can still be avoid it – how things develop from here on it up to the PBoC to decide.